The 70 mm depth profile, SWINGLINE it’s a 5-chamber system that values the air property as insulator. Galvanized steel reinforcements ensure static stability and long service life. Its special design thanks to the rounded profile shapes has multiple benefits and an attractive price. 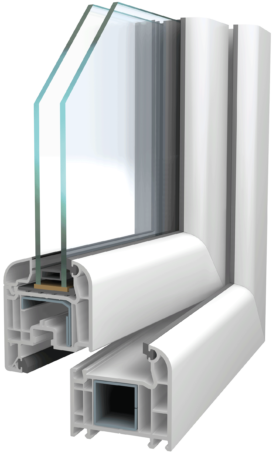 Depending on the type of glass used, the Uw value can reach up to 1.0 W / m²K (thermal transmission coefficient of the window including the glass) which considerably lowers the house heating cost. SWINGLINE design with slightly rounded edges, well-proportioned lines, harmonizes in a perfect way with various architectural styles, modern or traditional, whether it’s a new or a renovated building.